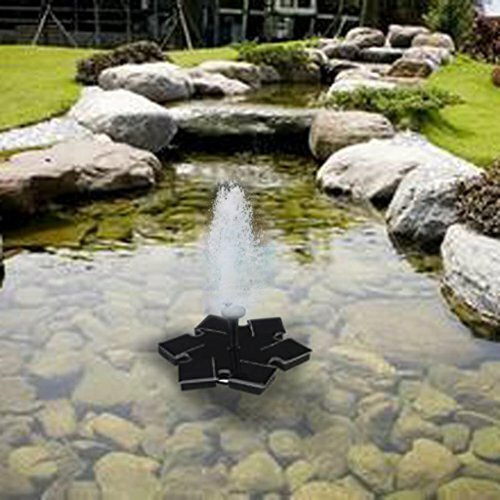 Minimum water depth in fountain: 1 3/4"
4: Keep the water and the pump clean regularly to avoid any dirt to block the pump. Removable and cleanable water pump, super quite submersible water pump which is strong fastness to solar panel,disassemble and easy for cleaning. The fountain pump is driven directly by the sunlight. Start automatically in 3 secs when sunlight shines on the solar panel. It will work continuously when the sunlight is enough. Premium monocrystal silicon solar panel works on 1.2w would show strong performance in weak light environment than 1.4w solar panel . Cause the smaller the watts are , the less sunlight is needed . Exclusive sunflower design with good implications, solar fountain inspired by Van Gogh's sunflower paintings. Solar panel 12 petal symbolizes: hope, glory, freedom, unity, faith, talent, happiness, friendship, love, health, youth, wealth.